A senior member of the House Judiciary Committee introduced a Resolution of Inquiry on Thursday that directs the Department of Justice to provide the House of Representatives with any and all information relevant to an inquiry into President Donald Trump and his associates’ conflicts of interest, ethical violations (including the emoluments clause) and Russia ties. 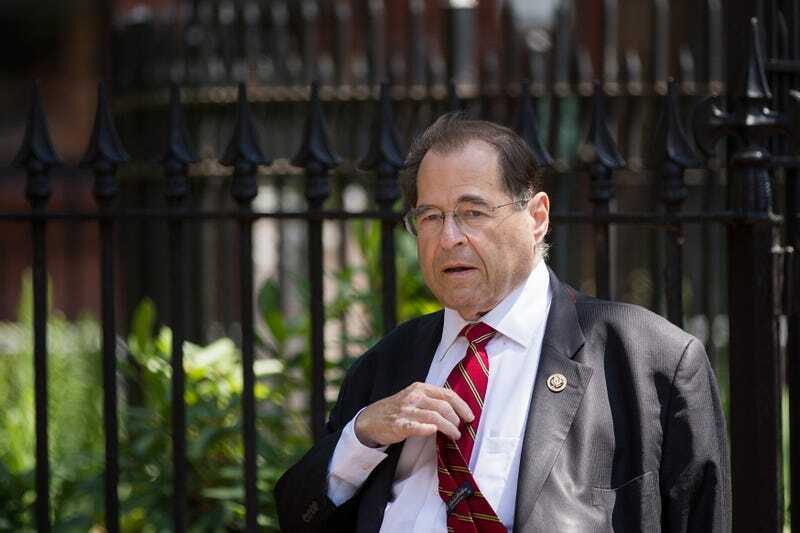 The House Judiciary Committee has 14 days to debate and vote on whether the resolution Rep. Jerrold Nadler (D-N.Y.) introduced should be introduced to the floor. If the committee does not do so within that 14-day period, then the resolution can be brought to the floor in front of the full house for a vote. Nadler’s resolution asks Attorney General Jeff Sessions to provide “copies of any document, record, memo, correspondence, or other communication of the Department of Justice” that pertains to any “criminal or counterintelligence investigation” into Trump, his White House team or certain campaign associates; any investment made by a foreign power or agent thereof in Trump’s businesses; Trump’s plans to distance himself from his business empire; and any Trump-related examination of federal conflict of interest laws or the emoluments clause of the Constitution. The full text of Nadler’s resolution can be read here (pdf). Nadler is the No. 2-ranking Democrat on the Judiciary Committee, and he said that the move came after Democrats sent two letters to Judiciary Committee Chairman Bob Goodlatte (R-Va.)—one on Nov. 30, 2016, and a second on Jan. 24, 2017—and another letter to House Speaker Paul Ryan (R-Wis.) asking for investigations into Trump’s financial entanglements. Flynn, Manafort, Page and Stone have all come under scrutiny for their alleged ties to Russian President Vladimir Putin. While Trump has stepped down from the management side of his businesses, he has not divested his assets, a move that was recommended by the nonpartisan Office of Government Ethics. Nadler himself has not mentioned or implied that this resolution has anything to do with impeachment of the president, but many are speculating as to whether this could be the opening salvo that leads us down that path. As a nation, we have watched the president make many questionable moves in his first three weeks in office, and the ties that many of his closest advisers in his administration have to Russia are undeniable. As a reminder, impeachment involves the levying of charges against a government official who has committed “treason, bribery, or other high crimes and misdemeanors.” The indictment comes from the House, and if a majority of lawmakers support impeachment the case advances to the Senate. The Senate then begins a trial with witnesses and cross-examinations, and a two-thirds majority is required to convict an official. In the event of a conviction, the official is immediately removed from office and could be barred from holding office in the future or face criminal prosecution. Nadler said that the resolution will force Republicans to debate their role in holding Trump accountable for his potential business conflicts, and it may force every member of Congress to vote on the matter. And that’s really all a lot of us want, right? Republicans are in control of the government, and they are letting Trump (someone on Twitter called him “President Twitler,” but I won’t do that here) run around like a Bébé kid just doing whatever he wants whenever he wants without checking him. It’s dangerous, and the fact that they act as if they don’t have the power to stop him is scary. Even if the resolution does not lead to impeachment, let’s start getting this man in check and redirect him to the purpose of his job, which is serving the American people.